Alec Lightwood: Believe me, I want to live with you, but you were right. Having an outsider live at the Institute, that is against protocol. And how can I expect everyone else to follow the rules, if I don’t follow them myself? Magnus Bane: I understand. I’ll move out first thing in the morning. Alec Lightwood: However, there is no protocol that says the head of the Institute has to actually live at the Institute. So, when you find a place, I was hoping that we could… both move in… together. 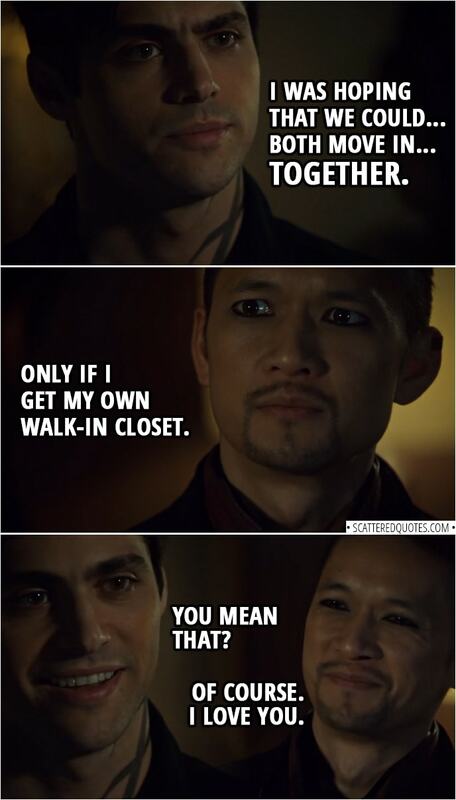 Magnus Bane: Only if I get my own walk-in closet. Alec Lightwood: You mean that? Magnus Bane: Of course. I love you. 27.3.2019 Hoping that we could… both move in… together.